Show your allegiance to the Lannisters with a house banner. Fair haired, tall and handsome, the Lannisters are the blood of Andal adventurers who carved out a mighty kingdom in the western hills and valleys. The wealthiest of the great houses, their sigil is a golden lion on a field of crimson. 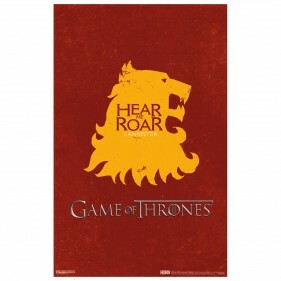 The Lannister words are “Hear Me Roar!” — Roar and make a statement with your own Game of Thrones House Lannister Poster.